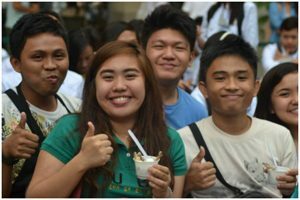 Kitchenpro (The Culinary Standard)is actively engaged in Culinary Social Responsibility(CSR) projects that focus on Culinary Scholarships, Culinary Education, & Livelihood Programs. The funding for these projects are derived from a portion of the proceeds of the sales of KitchenPro&Masflex products. 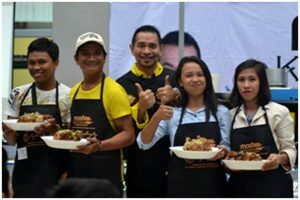 In regards to this, Kitchenpro brand ambassador Chef Gene Gonzalez conducted a free cooking demo with HRM students and local citizens of General Santos City was held at KCC Mall last August 16, 2014. 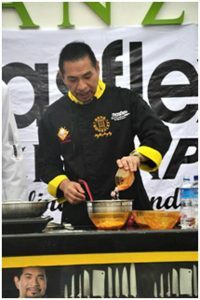 This is in partnership with his culinary school, the Center for Asian Culinary Studies (CACS). 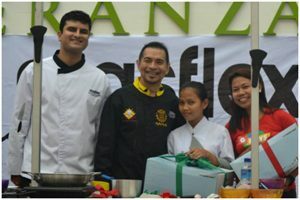 More than 300 students from different HRM schools, media partners, bloggers, and guests attended the Kan-Anan sa GenSan Cooking Demo where Chef Gene taught 4 recipes highlighting the province’s best ingredients. These dishes are Panfry Glazed Daing na Bangus, Maja Durian, Sarsaparilla Chicken and Ensaladang Dadiangas. All ingredients can be found locally, affordable and fresh. 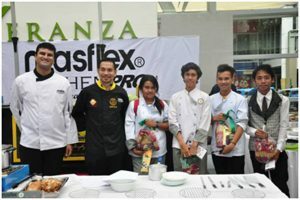 The audience members enjoyed participating in the cooking portion where they cooked Sarsaparilla Chicken and Pop Corn and experienced usingKitchenpro and Masflex products firsthand. 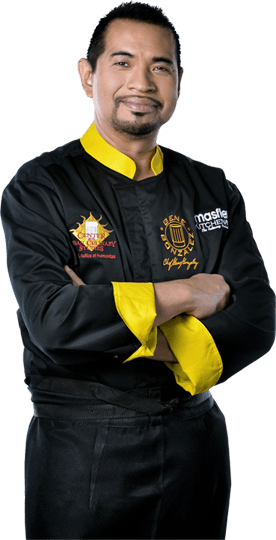 Chef Gene also did his famous Live Fruit Ninja segment where he sliced a watermelon in mid-air using KitchenPro 10″ Chef’s Knife in front of his live audience. He did it twice with 2 watermelons to showcase the sharpness of the said Kitchenpro knife. “It was really great to be back here in Gen San. The last time I came here was 14 years ago and there’s a lot of changes in places but the abundance of farm fresh vegetables, fresh livestock, and poultry, plus a strong fishing trade gives the General Santos city dwellers very natural methods of cooking and eating, which veers away from processed food products”,Chef Gene stated. 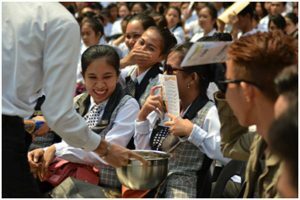 At the end of the program, all audience members received gift packs and prizes courtesy of food sponsors – Kitchenpro, Masflex, La Opala, Ideal Macaroni, Ajinomoto, Elba, San Miguel Purefoods and Magnolia Chicken. 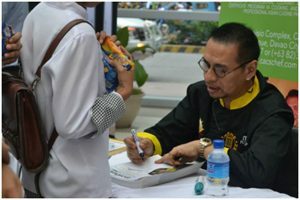 Chef Gene wrapped the event with an autograph signing and picture taking.